The world of betting is changing dramatically - say hello to Binary Betting. In recent years betting on sporting events and the trading of financial markets have been moving closer to each other, and binary bets are the result of this convergence. Binary bets combine the attractions of sports betting with the flexibility of the financial markets. Binary bets allow punters to: - Bet on hundreds of different sporting and financial markets - Close out bets before the event takes place - Profit from spectacular price moves - Bet in unusual and unexpected ways - experienced traders will love this This is the first book on binary betting and explains in simple language what binary bets are, how to trade them profitably and how to reduce risk. Within the book there are many real-life examples of binary betting trades and minute-by-minute analysis of binary price behaviour. 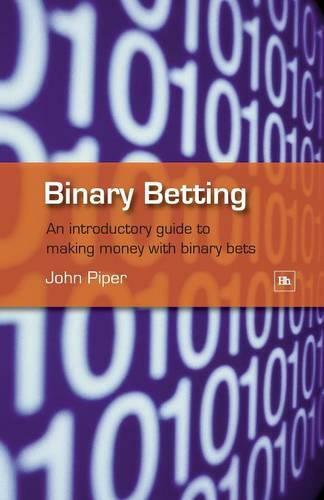 In addition the book includes inside tips from an experienced trader who uses binary bets in his trading day in and day out - discover the bet that pays out even when you get it totally wrong!Find out what makes binary betting the fastest growing area of betting and why traders are switching to the new exciting world of binary bets.